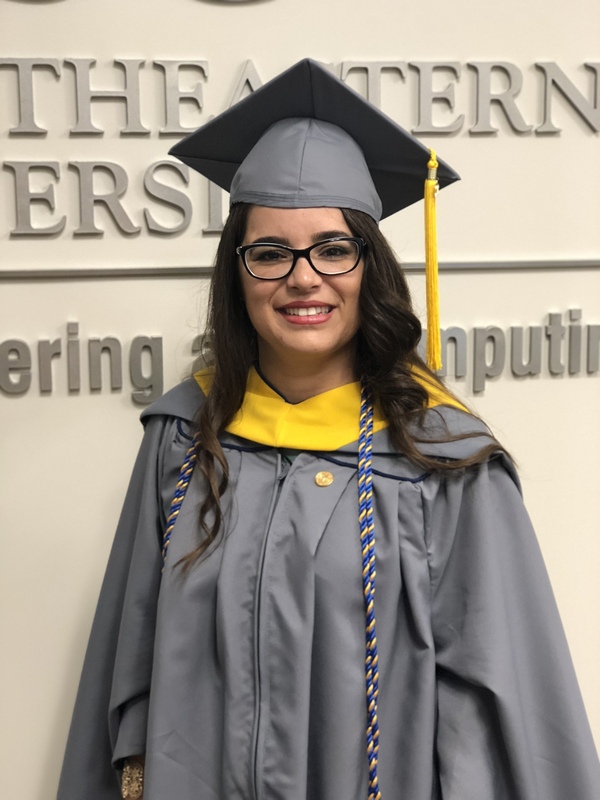 FORT LAUDERDALE/DAVIE, Fla. – Anabetsy Rivero, 29, graduated today from Nova Southeastern University (NSU) with a Masters in Computer Science from the College of Engineering and Computing (CEC), distinguishing herself on two levels. She is an unusual biochemistry graduate who went on to complete a graduate degree in computer science, and Rivero also formed her own company that is developing an artificial intelligence breast cancer screening software. While working as a biochemist researcher, Rivero said she realized that standard mammograms can often under or over diagnose, resulting at times in unneeded biopsies and other invasive procedures. It was at that time, Rivero said she became interested in developing a more accurate software screening. “I needed the computer science education to work on my company’s project,” said Rivero, who has an Associate in Arts in Biology from Miami Dade College and a B.S. in Biochemistry and Molecular Biology with a minor in Chemistry from University of Miami. Rivero said her strong interest in medicine can be partially attribute to her father, Nelson Rivero, who was a doctor in Cuba before the family immigrated to Miami. Nelson Rivero, by coincidence, just graduated with a nurse practitioner degree this spring. To develop her program, Rivero stated her Miami-based research company Vidu AI, that claims a high accuracy in screening with its artificial intelligence software. Rivero said the company is currently seeking $1 million in investment funding and also to get the software cleared by the federal Food and Drug Administration. About NSU’s College of Engineering and Computing (CEC): Providing educational programs of distinction, CEC prepares students for leadership roles in the engineering, computer science and information systems and cybersecurity fields. With internationally recognized faculty, innovative curricula, and flexible online and campus-based formats for its three Bachelor of Science, four Master of Science, and three Ph.D. programs – CEC’s graduates are sought after around the world. Designated a National Center of Academic Excellence in Information Assurance Education, their information assurance curriculum is recognized by the U.S. Department of Homeland Security and the National Security Agency. For more information, please visit http://cec.nova.edu.